The MS Experience, Issue #1109 -- The Link is Here! Come Join Us! We're are glad to be able to bring this issue to you. We missed another month due to a couple of things. First, our daughter got a teaching job in Saudi Arabia. So helping her prepare and trying to come to grips with the fact that she will be away from home for a whole year, took a little out of us. We've been in the dumps for the last week or so. Now that she's there and getting settled, and we've had a chance to talk to her and see her via the internet (skype), we are feeling a little bit better about the whole situation. We also updated the site a bit so that hopefully the pages are a little less cluttered and easier to read. We'll probably be updating even more in the next month or so to a whole new look. So look forward to that announcement in next months issue. Lastly, we added a networking group to our site called The Link if you haven't seen it yet. We've been trying to get it up to speed and get folks invited so that you will all be able to get to know one another more easily. If you didn't get an invitation, we haven't forgotten you - here is the link to join. We have about 14 members, including our teenage daughter. We have included a Teens, Kids and MS group that your children are welcome to join. They can ask questions, add photos or pictures, as well as interact with one another. Whether your child has MS or they are dealing with you having MS, they are welcome. You will need to help them sign in or they can sign in under your name. We're keeping this area a little more protected, so you can join by invitation only. If you are wondering about the home search, we've discussed it in detail and decided to wait till next year. There are so many things that we want, but we know that our time will come. We will continue this months newsletter with the focus on networking. We are so excited about our new networking site - The Link. We are excited about the possibilities it will bring to our visitors. It's a place for us to see one another and have discussions. We can share our favorite photos, videos, and music with one another. Cir started a discussion about your favorite pets (we'd love to have a dog), so join and jump right in to tell us about your special pooch, kitty, or other pet and the advantages of each. We didn't add a Book of the Month this month. I haven't been reading a whole lot lately, so don't have anything to recommend. Look for it again next month. I suppose the season has officially changed when you have to turn the clock back. Oh well, time to turn to those comfort foods that help make cooler weather more tolerable. One of those comfort foods we like is a very simple sandwich that you probably ate as a kid. And if you're like me, you still eat them occasionally. What sandwich is that? Peanut butter and jelly of course! Now if you are a person who doesn't like peanut butter and jelly sandwiches, you'll just have to bare with us. If you like, you can skip down to the next recipe - chicken sandwiches. So what's so special about a peanut butter and jelly sandwich you ask? Well, during the cooler months we like to make it just a bit more special. More like a dessert sandwich. Cir got the idea from his younger brother years ago. You may have also tried this before, so I'm sure you will agree that Grilled Peanut Butter and Jelly Sandwiches are the best. Serve them with a cup of steamy hot cocoa and you have yourself a dessert. A chill is definitely in the air, so this year, I'm actually making freezer blueberry jam. That way we'll always have some on hand when we want a quick dessert. I'm also going to buy four pounds of apples to make a sort of apple jam or apple butter. We have been making our own peanut butter for quite awhile, with unsalted, roasted peanuts, a little honey, a pinch of salt, and a little olive oil if needed. The last time we got peanuts we mistakenly bought raw peanuts, and had to soak and roast them ourselves. With our Vitamix, the results were extra creamy and so delicious. Spread on your peanut butter and jelly to make your sandwich. Set aside. Heat up your skillet or grill pan on medium low. Spread butter on one side of your sandwich. Place buttered side down in warm skillet. Heat slowly till golden brown. I peak every couple of minutes so that it won't burn. Spread butter on the other side of your sandwich. Flip sandwich with spatula and toast on other side. Remove from pan and place on a plate and serve with hot cocoa. A simple dessert, lunch, or snack sandwich. Enjoy! Note: We make this sandwich even more special by choosing jams or jellies that we don't normally eat everyday. Last month our daughter picked out boysenberry. Very good! Make yours special. Use your favorite jelly and nut butter and pick up a gourmet box of hot cocoa, there you go! Recipe is from our new site, Sandwiches Again? Check it out. And here's another sandwich recipe for you. Can you tell we love sandwiches? We shared three versions, one bar-b-que, one italian, and one honey mustard. You can just use your favorite chicken breast recipe instead. For bar-b-que chicken sandwiches, cook chicken breasts like this. Place two or three in a small glass oven dish. Pour a little olive oil over them. Mix a little barbeque sauce (our favorite is Sweet Baby Ray's) with a little water to thin it if it's too thick. Then season them with onion powder, garlic powder, paprika, black pepper, and basil. Bake for about 45 min. to an hour or till tender. This depends on how thick your chicken breast is.. Remove from oven and let rest a few minutes. Slice the chicken breasts in half inch slices from side to side. For italian chicken sandwiches, substitute italian salad dressing for the barbeque sauce and olive oil. Just pour dressing over your chicken breasts in the baking dish – seasonings are already in the dressing! If you want more, just add more onion powder, garlic powder, and italian seasoning to taste. For honey mustard chicken sandwiches, mix brown mustard (about a ¼ cup) with about 2 -3 Tbsps of honey. Stir to mix and pour over chicken breasts. Bake as for bar-b-que chicken. I don't usually add any other seasonings. I think the bread for a sandwich needs to match the filling. For a chicken sandwich you need something like french bread or a hoagie roll. Kaiser rolls would probably work as well. Layer on your favorite spread – mayonnaise, mustard, or nothing if you have used one of the recipes above. Next layer on lettuce, tomatoes, onions (raw or sauted). Top with sliced chicken breast. These are more like do-it-yourself recipes. You pick your favorite chicken recipe, your favorite sauce, and your favorite toppings. And you have the makings for a delicious chicken sandwich. Recipe also from our other site, Sandwiches Again? Words can build up or tear down. Words can make or break a relationship. One, two, three, four, five,... letters put together can show how much you love someone or how much you care. Life is just too short to spend it saying unkind words. 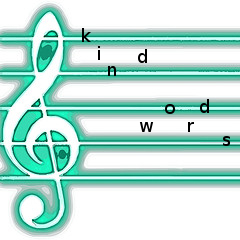 "Kind words are the music of the world". One thing that is a potential possibility for MSers after a significant loss of mobility is isolation. Isolation goes hand in hand with depression. MSers may begin making excuses for not keeping appointments or spending time with their family and friends. These are not unfounded excuses, however. They stem from real symptoms like fatigue. Sometimes it's just too difficult to get beyond the preparation stage, to then go to and participate in the actual event. You are too tired to enjoy it. Technology has come so far that you can now bring the world to you. Cir has always been a social person. Almost every job he has had in the past has been dealing with customers - mostly through sales. He's very big on customer service. Interacting with people - keeping in contact with others - for him these are part of his personality. Without computers, Cir would not have been able to meet other people who are in the same boat he is. In the beginning, he did have a few bouts of depression. Finding and talking to others, helped him get through those times. Get connected. Most likely if you are reading this newsletter, you are connected. I guess the question then would be, to what degree are you connected? And are you comfortable with the amount of connections you have? Only you can answer those questions. If the amount of participation you have is not tiring and you have a sense of belonging, then you probably have the right amount for you. If you are tired out after being online, then maybe you spend too much time and need to cut back. You decide. Along with the benefits you get from being able to connect with others, there are downsides as well. Be safe. You don't need to join every single group you find on the internet. Be selective. A few groups where you can meet other MSers and develop a group of online friends is plenty. If you were a social butterfly before you developed MS, you will probably still be one on the internet. Things are a little different on the internet, but learning your way around isn't that difficult. Cir has found many friends online. He regularly talks to many of them. Some of them have gone on to find other friends. Most of them have MS or are family members of someone who has MS. So they can relate. They worry about him when they haven't heard from him in awhile. And they call to check up on him just to make sure everything is okay. You don't need to sit at home alone with nothing to do. Get a computer or laptop if sitting at a computer is difficult or tires you out. Join an MS group or find a chat room. And when you are able, go out. There are support groups in almost every major city. So if you are still mobile, take advantage of these groups where you can meet others face to face. If not, get connected online. If you feel uncomfortable with one group, there are so many others to choose from. As I mentioned earlier, we started a social networking group last month. We have several members and are looking forward to welcoming you if you haven't joined already. Members can join and start discussions with other members. Ask questions if you need answers. Start a blog. Create albums and share your photos. Share music and videos. Meet others who also have MS. Make friendships. If you are a caregiver or family member of someone who has MS, there is also a group for you. If you even want to start a group, you can do that as well. Invite your family members and your friends. MS can be a lonely disease but it doesn't have to be. Come join us at The Link. Make suggestions and together we can make a safe place where you, your family and friends can come and hang out with others just like you. We have a cartoon this month - Yeah! So sorry for the lapse in fun - hopefully you had a back-up source for getting your laughs :) I'm working on several this month so we will be able to make up for the months we missed. You'll be able to find them in the archives as we get them finished. You can check here for the missing Cartoons of the Month in the next few weeks. 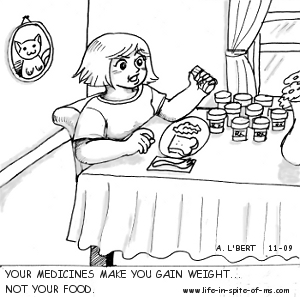 This months cartoon is based on a saying that was shared with us by Jane, a frequent visitor and friend of Life in Spite of MS. You can find her page here. Thanks Jane!